Look to the Walkman for the wisdom. "Your mommy's alright, your daddy's alright," promise the Cheap Trick vocals from their smashing anthem Surrender, the song that closes out Guardians Of The Galaxy Volume 2 with a line that, in context, seems like severe understatement: "They just seem a little weird." You don't say. Daddy issues have long been a staple of intergalactic storytelling, but things are noticeably nuttier in this film where many a father and father-figure is brought to task. At one point when a character wonders whether he should chase after the charismatic silver-fox claiming to be his father, another asks him that most eternal of questions: "What if this man is your Hasselhoff?" I'd loved the first Guardians Of The Galaxy, an eye-popping and irreverent treat, a stunning and stupendously silly space opera: Star Wars made for those who prefer a Deadpool to a Darth Vader. Featuring a non-star quintet of obscure comic book outcasts, director James Gunn had the elbow room to make things messy, mischievous and genuinely weird, and this time he subverts things even further: In Vol 2, for instance, we realise that every major character has a truly messed-up (and genuinely horrifying) backstory, and they've earned the right to be - as Cheap Trick sang - "a little weird." Little, of course, one says in a relative way. This is a giant film, a fireworks display punctuated by gags, a visually startling film that occasionally deploys its own laugh track - a hulking brute of a man laughing, loudly and in self-congratulation, at his own words, warm and booming and highly infectious - and gives us much not merely to stare at but, remarkably enough, to feel for. The film holds a surprising amount of pathos, not least in my favourite moment, where a raccoon-like character gingerly and worriedly touches the sides of his jaws - in silent, immediate examination - after someone casually refers to him as a "triangle-faced monkey." You know the band by now, of course. 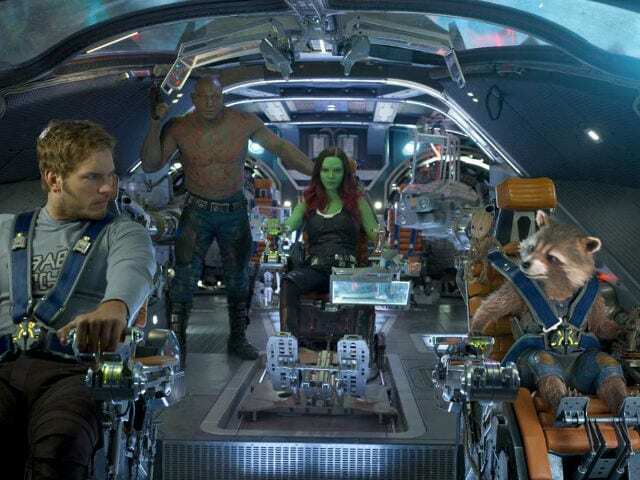 There's 'Star-Lord' Peter Quill (Chris Pratt), a swashbuckling hero-type who acts before he thinks, trying to keep these misfit brigands together; Gamora (Zoe Saldana), a green-skinned assassin who shoots off schoolbus-sized guns to teach her sister a lesson; Drax (Dave Bautista), all brawn (and yes, laughter) and tactlessness, with a body of muscular, veiny stone; Rocket (Bradley Cooper), a perpetually growling weapons expert who has trouble winking; and, of course, Baby Groot (Vin Diesel), a pocket-sized twig who is tiny and feral and could prove to be very useful indeed if only he understood what he was being told. The band's back to their usual shenanigans, stealing things and being all outlaw-y, carrying a purple prisoner while on the run from golden people and cobalt blue people. (If ever there was a comic book series clamouring for elaborate colouring books...) Purple, honestly, doesn't do Nebula - Gamora's sister, played rather wonderfully by Karen Gillan - justice. Her face is like the Moonlight poster come to life. This is a film, however, about Ego. While Ego - as befits the name - is certainly complicated, the film is full of characters driven by insecurities, confidence issues and the need for validation. It's rare to see a smorgasbord of unique characters with such clearly-defined conflicts and motivations, and Gunn sneakily keeps telling us more than we think we know, taking a rollicking, trippy story and raising the storytelling stakes till he eventually builds up to something truly moving. This is a long film and despite the inventiveness, coherence and sense of play imparted to the action sequences, some feel a tad too long simply because the results always seem inevitable. There are five end-credit sequences, by the way, so the film doesn't even end when it claims. Also, in introducing new characters - like Elizabeth Debicki's gleaming Ayesha and Sylvester Stallone's Stakar Ogord, both doubtless bound for bigger parts in Volume 3 - and the Peter Quill and Gamora relationship feels shortchanged. Merely mentioning Sam and Diane from Cheers does not, alas, a Sam and a Diane make. Guardians Of The Galaxy was unlike any superhero movie we'd seen before, and, in contrast, Volume 2 mirrors it rather loyally, playing off it instead of breaking new ground and standing on its own, but - as sophomore albums are bound to do - it has more to say even if we've heard these sounds before. The ones echoing relentlessly in my head come from a song by Silver that captures the film's spirit with pop panache: Wham. Bam. Shang-a-lang.